The media ecosystem is changing. We can feel it. TV used to be “free,” over the air and advertising-supported. But now it’s increasingly by subscription, and even the NBC shows on Hulu are a mix of ad-supported and subscription. But what if there’s a new media ecosystem on the horizon — one that doesn’t rely on advertising at all? As the internet weaves its way into every part of our lives, the old methods of broadcast advertising that demand attention are turning off audiences, millennials, and their younger friends. Why? Because audiences don’t want to be lectured, sold to, preached at, and overwhelmed. The old idea of dominating with brand voice doesn’t work in the world of conversational marketing and social engagement. And platforms like Facebook and YouTube are finding that selling brand advertisers spots adjacent to the wild West of the open web doesn’t work, either. AT&T, Nestle, Disney, and Hasbro are pulling ads off YouTube due to objectionable content in the comments section next to videos of young children. “Herein lies the paradox of all advertising in the information age, online or otherwise. If there is one thing that the internet has made it easy for consumers to access without the help of advertising, it is information – and especially information about products,” writes Woodcock. Woodcock bases his argument on his reading of antitrust laws. He poses it this way: Imagine a world wiped clean of advertising of all kinds -- from sponsored Google search to Facebook’s sponsored posts as well as TV commercials and billboards in the offline world. Would you still be able to find all the information you could ever want about products in this alternative world? Of course you would. So if advertising is obsolete, what replaces it? What if brands, services organizations, and associations don’t really want to sell things? What if instead, they want to share stories, invite action, and reward readers/viewers who embrace their story and share it? Is endorsement and amplification as important a measurable outcome as ringing the register for organizations with social rather than economic goals? As consumers begin to consider, and then demand, control over their personal data, the power to register preferences puts users back in control of what they buy, and how their preferences are inculcated in user data. Which could well lead to user- controlled AI and interaction with chatbots. Chatbots have significant advantages over advertising. Deep learning and predictive analytics allow them to have data-driven relationships with users. They are adaptable — more than an ad campaign can ever be. The more you share with a bot, the more it can fine-tune its response and the offers it shares with you, driven by your past-purchase history and behaviors. Advertising is information. Information is either controlled by the platform or by the user. Today, Facebook and Google are “free,” but we pay these platforms with our data. And advertisers pay the platforms to target us with an endless flow of offers and come-ons. But Woodcock and others think the time has come to no longer make users into the “product” and instead once again make users the customer. Using emerging tools like blockchain, user preferences and behaviors may once again be the property of users, shared knowingly, and in ways that benefit users rather than put them in the line of fire for a barrage of poorly targeted ad campaigns. Much as junk mail is now managed by increasingly capable fillers, junk advertising may be the next recipient of smart filters and engaged consumers. Are ads obsolete? It may be time to find out. *Rasmi Woodcock will be at SXSW, on a panel with Tracie Lee, product design director of The New York Times, and myself. The panel will be moderated by commentator and comedian Baratunde Thurston. It’s March 8 at 11 a.m. You can learn more about the panel here. Hope to have you join the conversation in Austin, or in the comments section below. 10 comments about "Is Advertising Obsolete?". Paul Street from Numeris, February 25, 2019 at 1:28 p.m. I suspect the author has missed much of nuance of advertising impact. True, many people don't want to be lectured or sold to, but they don't mind being reminded - something that advertising does splendidly for FMCG. Hit the wrong AI and an 'occasional' brand will drift away like high school friends. Ultimately, sales promotion and discounting are fine marketing tools (Hey GroupOn, where did you go?) but it's advertising that builds the crucial emotional dimensions of brands which are the drivers of profitable purchase behaviours. Doug Garnett from Protonik, LLC, February 25, 2019 at 2:12 p.m.
Paul has it true. What's creepy is how this "people don't want to be sold to" pitch mostly comes out of the advertising business. I've never heard a customer say something like that except when they're leaving a car dealership. In fact, consumers are frustrated that ads no longer offer much information - no longer help them discover new interesting things. This writing alos misses that online options are HORRIFICALLY weak at putting out new products. IF you already know what you're interested in, then online is tremendous. But consumers enjoy discovering new things but that doesn't often happen online. TV, radio, print...yup...traditional media are far better at developing the base for economic growth. Ed Papazian from Media Dynamics Inc, February 25, 2019 at 5:29 p.m.
Agree with Paul and Doug. 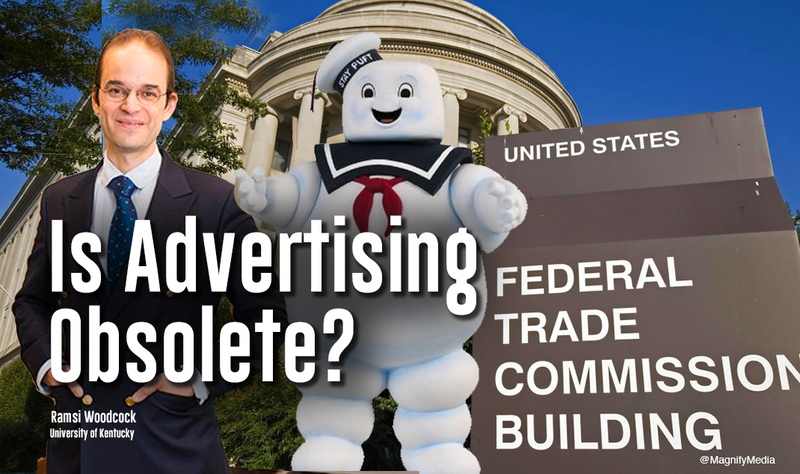 The idea that a "good for you" brand might not be heavily advertised relative to a not so good brand which has more money to spend on ads ---hence the Feds must take action to get rid of all advertising in the public good really confounds me. Contrary to what some think, the public at large still thinks that ads are a fair price to pay for content they wouldn't get elsewhere---like free on YouTube. The public is bugged by cable channels that present hosts of commercials in cluttered breaks, however, and by the wild west, herky jerky approach to scheduling ads in degital media as well as the nagging, annoying practice of tracking you. That doesn't mean that advertising, as a concept will soon depart the scene. Indeed, many people like ads---certainly in magazines and often on TV as well as radio. They find them useful ---telling them about new products, entertaining them and, for many, showing them how "typical people" behave. It's foolish to assume that we are in need of a marketing system where the consumer is totally in control and buys only what he/she wants. Yes, sometimes, but often we learn about new ways to use products as well as products we didn't even know about via advertising. In other words advertising, despite some faults, opens our eyes--and/or ears--- to options that we would never be aware of. What's wrong with that? Steve Rosenbaum from MagnifyMedia replied, February 25, 2019 at 7:39 p.m.
Hey Paul, thanks for sharing your thoughts. I'm wondering, are you saying you think advertising, it it's current form is good for society or a necessary evil? Does advertsing, centralized in a handful of platforms, provide value to consumers, to brarnds, or to publications. All three? None of the above? What if we could invent something better that connected consumers to brands and publishers. Would you engage in that exploration - or stay put? Steve Rosenbaum from MagnifyMedia replied, February 25, 2019 at 7:43 p.m.
Hey Doug, thanks for joining the conversation. Here's my question - would you say TV, radio, print are stronger today than five years ago? What will they be in 5 years? How do we get in front of consumers with ideas and offers they don't know they want, when someone can use Tivo, or another browser tab, or Spotify rather than radio? If old models are fading, what takes their place? Steve Rosenbaum from MagnifyMedia, February 25, 2019 at 7:44 p.m.
Ed - do you have any data to back up the claim "that public at large still thinks that ads are a fair price to pay for content" - isn't the trend from cable to OTT and subscription (netflix) suggest that people are moving away from servies that have interuption advertising as their core economic basis? Ed Papazian from Media Dynamics Inc, February 26, 2019 at 5:17 a.m.
Steve, for years researchers like Gallup---if memory serves---- asked people that exact question about TV and about 70-75% agreed that ads were a fair price to pay for watching TV commercials. More recently the questions are posed differently so I can't cite a 2018 study that asked it exactly the same way---if anyone knows of one please let us know. As regards public attitudes towards ads, there is plenty of evidence that they are not despised to the extent that some believe. For example a recent Nielsen study---2015 or 2016----reported that 63% of its North American respondents "trusted" ads seen on TV with similar findings for radio, and print media---but online advertisng came in at much lower levels. A 2017 study by Clutch asking similar questions reported just about the same thing. In addition, MRI and Simmons routinely ask respondents how they rate advertising on each medium and, again, they find a significant degree of fairly positive attitudes to go along with the negatives. I'll look around and see if I can find a current study which used the same terminology ---"fair price to pay" ---and will let you know if one turns up. Craig Mcdaniel from Sweepstakes Today LLC, February 26, 2019 at 4:23 p.m. Being one of the largest online sweepstakes publishers over 15 years, I take a different view on the subject. As an industry, the sweepstakes publishers has been block from receiving sweep ads to our websites by Google and others. The method of blocking is simple, over 10 years ago, the ad distributors created blocking categories. For us in sweepstakes publishing, we were added to in the category of "GAMBLING". We have nothing to do with placing bets or poker or gambling with credit cards. By putting us in the category of "GAMBLING", the CEO's of nearly major Fortune company would also be considered criminals when you connect the dots. No, isn't the problem some would say. For me it's like being called a felone but no one can say what the charge is. That is what advertising is coming to. There are many ways to block ads in a medium but with fake justification why it should be done. Blocking should be reevaluated and the rules made clear for the FCC gets involves. Doug Garnett from Protonik, LLC replied, February 27, 2019 at 4:34 p.m.
Steve - Yes. I have found in clearly measurable ways that TV (at least) remains as strong - if not stronger - than it was 25 years ago. In fact, JAR reserach showed that its power and effectiveness increased from 2000 through 2008. The browser tab problem isn't huge. A digital browser is a poor substitute for watching TV so only a small portion of TV time is spent ther. The place where we should put our questions is on streaming — those are the services which threaten traditional TV. And what's going on there? The streaming services are scrambling quickly to add TV advertising to their offering in a good way. Hulu won't let you skip it - neither will many others. Netflix remains outside of that but their content development costs are so high that they will likely have to embrace advertising within their offering. My sense is that after the dust settles, TV will mean a mix of traditiona and streaming and on demand and time delayed... And it will continue to be the way to get a message in front of people. What I find in my work is that consumers don't mind being sold to as much as ad people claim. What consumers want are for advertisers to do that well. THEY understand the deal - the trade off where they get content for putting up with ads. They just wish we wouldn't think their stupid... By putting out ads without the useful and meaningful things they want... By trying to dress up ads as if they're just content... By bait and switching them. Doug Garnett from Protonik, LLC, February 27, 2019 at 4:34 p.m.